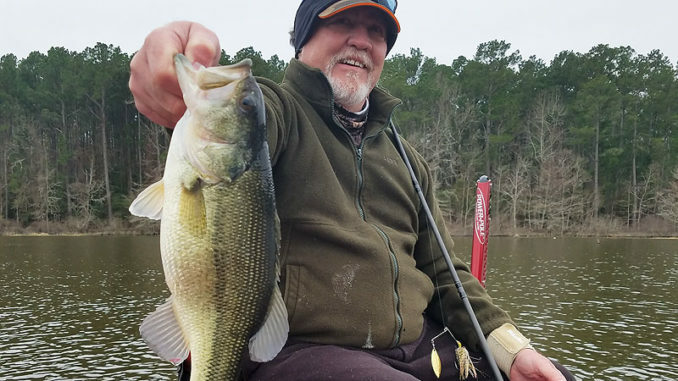 This angler holds a 3-pound-plus bass he caught on a spinnerbait while fishing with Dean the last week of February at Toledo Bend. They were fishing in Torro Bay. 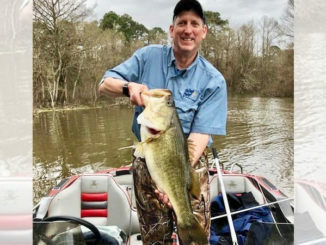 While late winter bassin’ success left a lot to be desired because of weather and water conditions, I’m looking forward to April to restore the order on Toledo Bend. Bring on the spring! 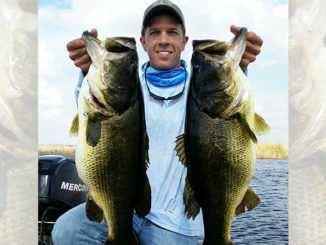 Will it happen as far as catching the majority of bass in their traditional spawning environment? We’ll see what transpires when the average water temperature stays in the mid-60s and, as usual in the past, eventually reaches the 70s in April, I told Caleb Sumrall over breakfast this morning at Toledo Town and Tackle. Caleb is a Bassmaster Elite angler from New Iberia who also guides on this lake with Darold Gleason’s South Toledo Bend Guide Service when he isn’t on the tournament trail. Like myself and so many others, Caleb is anxious to see if the bass fire up after cold water and heavily stained water conditions (in the backs of creeks) subside — hopefully by early spring. A strong cold front in early March pushed water temperatures back down to the low to middle 50s. The Basspro.com Bassmaster Central Open anglers were challenged by those conditions Feb. 20-22. Gleason, of Many, rose to the challenge and came from behind to win with 40 pounds, 2 ounces, when the first-day leader with 22 pounds, 11 ounces, and first-day runner up with 21 pounds, 7 ounces, respectably, both stumbled hard on the third and final day (the second day was canceled by inclement weather). The early leader zeroed and the early runner up brought in 6 pounds. Getting bit in February and beginning of March was hit-and-miss and more frequent sometimes when fishing deep. Really, it should be the other way around. As of the first week in March the majority of fish weren’t up on their beds, based on my observations and field reports from across the lake. If they were there, though, chances are we couldn’t see them because of the water clarity. I’ll venture to say they just weren’t there yet, which bodes well for April. We really haven’t seen the first wave of spawners. I’m figuring the spawn just might be a month behind. 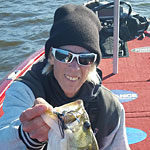 You would think bass on Toledo Bend will be at the height of their spawn by April. I sure expect that to be the case and it’ll be game on in 3- to 7-foot depths. Main lake points, ridges, humps and ditches should be productive as warmer water temperatures expand to the open water because of the increasingly longer days and, hopefully, more sunshine. What I’m saying is anglers shouldn’t have to go to backwaters to catch bass consistently in April. More and more bass will be on the move to find their spawning sites, moving out of the 10- to 15-foot depths into the shallower water. 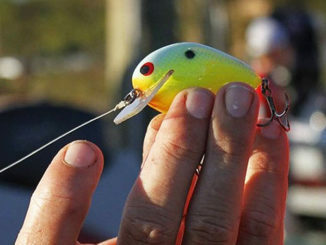 Chances of hooking up with a double-digit bass should skyrocket this month. It should be a banner April for bass 10 pounds or heavier! It’ll be time to target the spawning bass with Carolina-rigged soft plastics, as well as dead-sticking Zoom Super Flukes and whatever soft plastic offering is your favorite. I’m going to use C-rigs with Flukes and U99s, plastic lizards and creature baits in 4- to 7-foot depths and wacky worms, during the spawn. Top colors year-in and year-out are watermelon/red and green pumpkin/red. Darker colors should be effective in stained water. It’s still a prime time to be throwing horizontal search baits like Chatterbaits, chartreuse/white spinnerbaits, red-hued Rat-L-Traps, Rogues and Redfins. I’ve been guiding on this lake most of my life and you’re welcome in my boat. April should offer a good chance to catch a bragging-size bass. Give me, John Dean, a call at (936) 404-2688. John Dean has been guiding on Toledo Bend most of his life. If you’d like to join him on a trip, give him a call at (936) 404-2688.